November is a time of gratitude, family, shorter days and holiday cheer. But it’s also the height of election season, which comes with a whole lot of political angst. This year Pucci Foods was following one battle closely. While it’s not tied to a particular proposition or candidate, it hits very close to home. We’re talking about federal plans to expand offshore oil drilling along the California coast, and Governor Jerry Brown’s attempts to make sure this never happens. In January, the U.S. Interior Department unveiled a proposal to open 90 percent of America’s offshore oil and gas reserves through new federal leases, the largest number of lease sales in U.S. history. In September, Governor Brown announced firm opposition to expanding oil drilling on California public lands. “Not here, not now,” he said. “We will not let the federal government pillage public lands and destroy our treasured coast.” In addition, Brown signed two bills designed to make it impossible to build new oil drilling infrastructure. 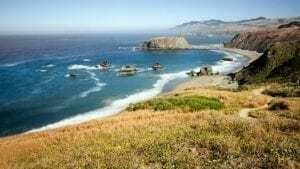 While the federal government has rights over waters between three and 231 miles offshore, California controls everything within three miles of shore. Brown’s thinking is that by banning new pipelines and other infrastructure, there will be no way to get the oil back to dry land to be processed and sold. Pucci Foods applauds these efforts to protect California’s coast. As a seafood supplier, the health of oceans and waterways is crucial to our success, and our longevity. But it goes beyond that. We believe in our collective responsibility to protect our fragile home, planet earth. From the very beginning we’ve made a promise to our customers, and to ourselves. We strive to provide the freshest, safest products nature has to offer. This takes a commitment to integrity and ethics above the bottom line. So when the federal government eyes California’s coast and sees dollar signs instead of beauty and a fragile ecosystem, we are incredibly thankful to operate in a state whose leaders see things the way we do. Oil spills are not a matter of if, but a matter of when. It’s only been three years since the devastating oil spill near Santa Barbara. Over 140,000 gallons of crude oil ended up in the ocean near Refugio State Beach in 2015, when a Plains All-American Pipeline ruptured. According to the Center for Biological Diversity, the spill created a ten-mile oil slick that threatened, injured and killed many species of wildlife, including humpback whales, dolphins, pelicans, otters, lobsters, and several varieties of fish. It will be years, if not decades, before the full extent of the damage can even be measured. The Center also put a price tag on the more than 600 oil and gas spills, explosions and accidents in California since 1986: $769 million in damages. And nearly fifty people have died in the incidents. The dangers and the costs could not be more clear. As we look forward to celebrating Thanksgiving in our large Pucci Foods family, we have an extra sense of gratitude this year. Thank you Governor Brown for standing up for conservation. Thank you California seafood lovers for sharing our values of sustainability. And a big thank you to all the businesses we partner with, for cherishing the same culture of integrity.